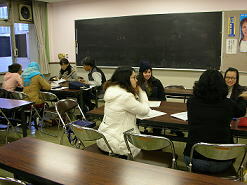 The Japanese Language Class are designed to help foreign residents adjust more easily to life in Japan by learning basic Japanese conversation skills. Each session is ten weeks in length. There are three sessions conducted every year. The class is free of charge. Don't hesitate to call for further information or go to the Seinen no Ie directly. No prior registration is required. - Students are free to attend as often as they choose. - No prior registration is required. Go directly to the class (room #1 on 1st floor). - For further information call the KIEA office at 0277-46-1111 ext. 537. - Summer Class will start in September 2019.